Customer experience is key. While this can be said of any business, it’s especially true within the travel and hospitality industry. Travelers turn to social media throughout every step of the their journey, from start to finish. For hospitality brands—hotels especially—your work starts even before a trip is booked. This industry relies heavily on word-of-mouth marketing, most of which takes place online nowadays. But by not being involved in those conversations, you’re taking a big risk. A 2013 Nielsen survey found that of those who used social media to research travel plans, only 48% stuck with their original plans—33% switched hotels. A focused approach to social media can result in a stronger brand, greater exposure and better relationships with first-time and repeat guests. Here is how some of the hospitality industry’s leaders are using social media to go above and beyond to create exceptional experiences. You know where your guests are staying tonight, but do you know where they go to ask questions or talk about you? To better serve your guests online you must first know which social networks they’re spending time on. “Some hotels find their guests love the creativity and photography found on Instagram, while others find that their guests are more interested in the real-time service assistance found on Twitter,” said James Geiger, Social Strategy and Activation Specialist at Hyatt Hotels Corporation. Knowing where your guests communicate online will help you provide a better customer service experience while enabling you to reach the right people at exactly the right time. To be successful, you’ll need a better understanding of the demographics of each of the major platforms as well as those of your target audience. “We’re focused on building long-term relationships with our guests, and that means we want to be where our guests are,” Geiger said. “Many guests connect with us on Twitter and Facebook in advance of their stay regarding a special upcoming weekend, requesting ideas for activities to partake in, dining recommendations and other key experiential elements of that sort,” said Courtney Morrow, Social Media Marketing Manager at the Hilton Anatole Hotel in Dallas. In fact, according to a USA Today survey, the No. 1 reason guests contact hotels on social media is for local information. By providing travelers with useful tips about the area, you’re demonstrating that your interest in them doesn’t disappear the minute a guest steps foot outside the lobby doors. Before social media, hotel concierges couldn’t accompany guests outside of the hotel. But thanks to instant access to sites such as Instagram, Twitter and Foursquare, travelers are never without inspiration. “Social media has enabled our hotel to act as a ‘digital concierge’ of sorts for our guests that allows us to create an additional personalized communication touch point,” Morrow said. Trump International Hotel & Tower in Toronto elevated a visitor’s experience in this way. When Ana Silva O’Reilly was looking for information about dropping off a rental car, Trump’s concierge team was ready to jump in and assist. Meanwhile, The Ritz-Carlton has created an entire campaign around the digital concierge. 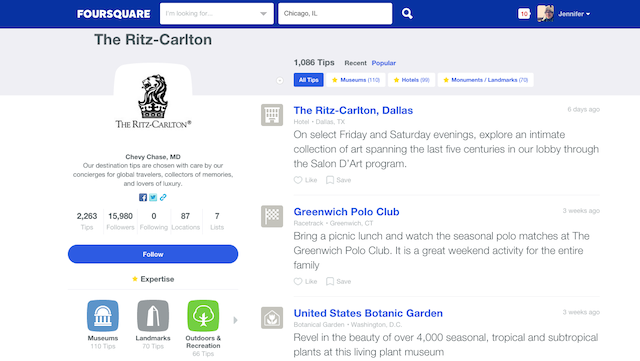 In June, the hotel brand published its 1,000th tip as part of its World Concierge campaign on Foursquare, which combines insights and tips from 89 of its concierges from around the world. Many of these tips come from seasoned concierges, such as Atlanta’s Jessica Gorman, who has been providing hotel guests with travel advice for nearly 11 years at The Ritz-Carlton, Buckhead. Gorman, who spends little time at home, prides herself on anticipating guests’ needs. “I always want to be ahead of the guest and know exactly what is new and interesting and what will be best suited for them,” she said. Similarly, @HyattConcierge on Twitter does everything from offering a friendly welcome to guests who check in on social media to sharing restaurant recommendations to answering guests’ questions. Hyatt keeps the account running 24/7 with help from its teams around the globe. Sometimes it’s the other way around. The concierges at the Radisson Blu Aqua Hotel in Chicago refer to weekly postings on the hotel’s social profiles as a reference to what’s new and fun to do in the area when talking with guests. By highlighting the expertise of your staff, you’re reassuring guests that you have their best interests in mind. This makes you an invaluable resource for travelers, who will hopefully look back on their trip and associate your hotel with an incredible experience. About 33% access Twitter before or after a trip. Almost 20% use Twitter to share feedback throughout their travel experience. Usage spans the entire travel process, so it’s important to develop and maintain strong relationships with your guests. This is something you should start doing before your guests even arrive. For example, your social media pages can act as a point of reference for travelers. Pinterest, Instagram and Facebook are a good bet for this effort. If you have a profile on any of these platforms, be sure to include important information, including in-room amenities, overall hotel accommodations and events around town. If you can answer guests’ questions before they arrive, you’ve helped them start their trip off on a good note. Take time to get to know your guests and their preferences. Do they request an additional towel? Are their pillows arranged a unique way? Do you notice a particular snack missing from the minibar? Make note of what they ask for and what they’re using in the room. You’ll also want to pay attention to social media for details that might explain why your guests are staying with you or opportunities to make someone’s stay special. Hyatt did just that after a guest posted a picture of a sonogram and expressed sadness that he couldn’t be there at the doctor’s office to witness the momentous occasion in person. The hotel saw the man’s social media post and quickly put together a “man-package” of various beers, bacon and other snacks with a handwritten note to congratulate the father-to-be. When a couple Tweeted about celebrating their wedding anniversary at The Hilton Anatole—where they stayed over their wedding weekend—Morrow and her team recreated the amenity experience from 20 years prior, which included a bottle of Champagne and a piece of wedding cake. Guest relations don’t end the minute someone checks out. After their stay, guests will be telling everyone they know about their trip as well as their experience in your hotel. How you treat guests following their stay can influence where they—and others—stay in the future. Fernanda Williams, Social Media Administrator at staySky Hotels & Resorts, went above and beyond to help an international guest who had misplaced an item during one visit. Worried about long-distance calling charges, the guest reached out to the hotel through Facebook. Williams contacted the hotel, found the lost item and mailed it back to the guest promptly. Even something as simple as a Retweet or a thank you can turn a great stay into an exceptional experience. “Once a guest has left, we will often Regram a great photo, or in the case of group or business meetings, we will thank them for choosing our hotel to host their program,” Dille said. This could also lead to more social engagement from your guests. According to Iconosquare, 76% of Instagrammers said receiving likes encourages them to post more, while 65% said they’d feel flattered if a brand liked one of their posts. A simple greeting, such as this one from Trump Toronto, will help ensure your repeat guests receive exceptional service every time: “We keep track of our conversations and ensure that if they return to the property we Tweet or comment back by saying, ‘Welcome back’ or ‘Glad to have you back again @TrumpToronto’,” said Jeanne Marie Castor, Marketing Coordinator at Trump International Hotel & Tower. It’s only natural for guests to share their experiences, both good and bad, on social media—but many of them don’t wait until they’ve returned home to do so. In fact, 72% of travelers post to social networks while still on vacation, so it’s very important to keep a close eye on social mentions. Imagine a hotel that has a screen displayed in the lobby so guests can see what others are saying about their experience on social media. Now imagine that a guest is unhappy with the wait at the hotel’s restaurant and Tweets about it. Not only does that guest’s followers see that he’s dissatisfied, but all of the other guests staying at that hotel do too. If his complaint goes ignored, everyone following that Tweet will assume that the hotel isn’t interested in customer service. But if the hotel responds quickly, they’ll rest assured knowing that, if they were in the same situation, they’d be heard and get a response. There’s a huge opportunity for the travel and hospitality industry to improve in this area, according to data from the The 2015 Sprout Social Index. Currently, the average response time for this industry is 11.5 hours. That means if a guest complains about room accommodations on social, nearly half a day passes before a reply is issued. What’s worse, only 11.3% of messages requiring a prompt response even get one at all. Smart hotel companies recognize that actually engaging with customers via social could yield a competitive advantage. By responding openly, anyone following the Tweet knows that the hotel is listening and really cares about providing good service. Taking the issue offline or in private after that initial response is key because it gives the guest your full attention and shows you’re serious about getting the issue resolved. Faced with a similar situation, Dille’s team at the Arizona Grand Resort & Spa took action immediately and connected an unhappy guest with an on-duty manager. “Putting the guest in touch with someone whom they could speak to directly made all the difference and turned a frustrated guest into a happy one,” Dille said. An angry Tweet can spiral out of control very quickly, so even if you don’t have a solution in place right away, acknowledge the issue and let guests know you’re willing to resolve it. They’ll understand if you’re personally unable to fix the issue, but will appreciate you putting them in contact with someone who can. “In my experience, showing that we truly care and are concerned about the guest experience goes a long way,” said Morrow, who answers every guest review, complaint, accolade and comment that’s posted to the Hilton Anatole’s social channels. But don’t let your desire to solve problems deter you from other engagement opportunities either. Monitoring for customer complaints shouldn’t be the sole purpose of your social listening strategy.